Zingaro Wagon sits at the end of the garden of The Old Stable apartments in its own quiet private garden space. 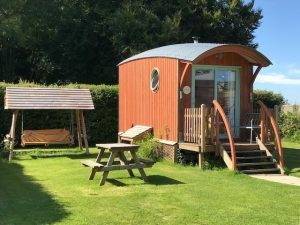 The wagon is made by Barrel Top Wagons, a local business, who make solid, unique timber wagons and lodges and offer a bespoke carpentry service using locally grown timber to deliver beautiful, original designs. 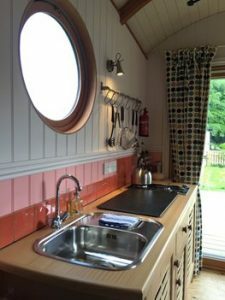 Their wooden caravans are more substantial than shepherds huts and gypsy wagons and we know our visitors will love it! 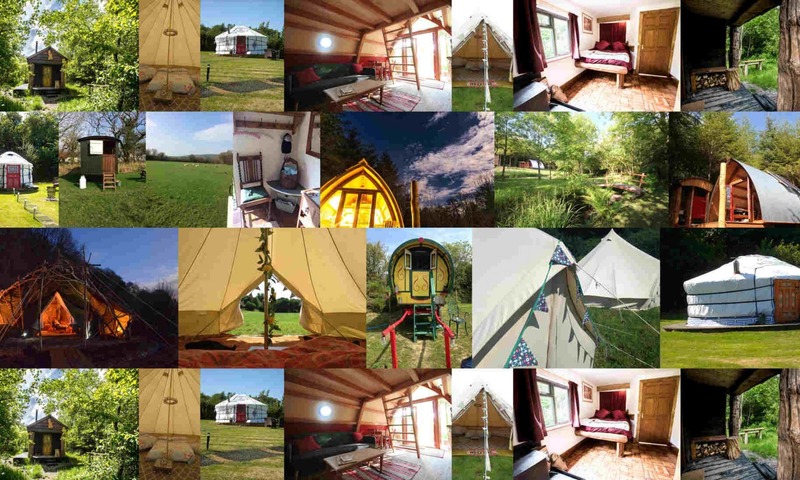 This is glamping with luxury, along with the enjoyment of The Greenhouse Spa. Enter the wagon via some wooden steps and onto a small wooden balcony and through the large glass sliding doors. The interior is open plan with the simple kitchen as you walk in. There are plenty of shelves for food, with crockery and kitchen equipment and a microwave oven on one side and on the other a two ring gas hob, small fridge/freezer worktop and a kitchen sink. We leave tea, coffee, sugar and hot chocolate to welcome your arrival along with some milk in the fridge. There are also essential herbs, spices and oil. At the far end of the wagon is the living/sleeping area. Room to hang and shelves to place your clothes and wooden steps up to the double bed on the mezzanine area above the dining/sitting area. The sitting area below the bed has a table and side benches to sit 4 people, which will turn into another double bed if needed. 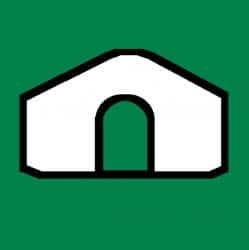 We provide bed linen for the bed above the dining area and sleeping bags for the bed below. There is a small flat screen Freeview TV on the wall in the dining area. 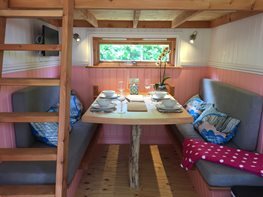 The wagon has electricity and free WiFi and hot and cold running water. The wagon is best suited to a couple or a family with 2 children. It is not suitable for four adults. Between the kitchen area and the living area is a wood burning stove with kindling and logs provided for the chillier months. 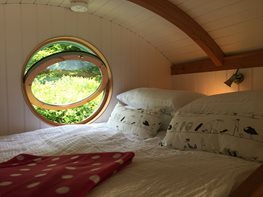 The whole wagon is insulated with wool, so it is beautifully cosy at all times. Bed linen and towels are included. Purple towels are provided for use in the spa. 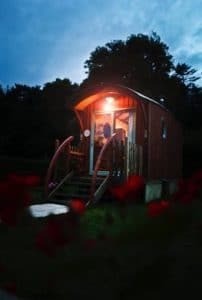 About 10 metres from the wagon is The Greenhouse Spa, where you will find your private shower and next to this a separate, private toilet. The shower has its own outside entrance and is for the use of Zingaro guests only. The spa offers a two person cedar hot tub and sauna and we can also offer the services of a local beautician, Jess Beagent, if you fancy some pampering and relaxation during your stay. Beside the wagon is a two ring gas BBQ, if you fancy cooking outside, with a seating area and table to enjoy those summer evenings. Zingaro is a beautiful, peaceful and unique space.